Representing the dark cygnotic side. With tranceleading Nordlead-Synthlayers accompanied by the transcendental waves of humpbackwhales we are introduced to the 'Pulsating Spheres'. This introducing statement reflects on the conclusion that particular reactions just come to pass when all involved elements pulsate in resonance...wavelengths of the magnetic field, optics, acoustics, electrics...and the mind...an unison accord within the fabrics of universe and our created reality. The track is inspired by the book 'The Bridge to Infinity' by Dr. Bruce L. Cathie. There Cathie theorizes about the unused potential, that nature provides but that is still locked in its fullness because of ignorance, disbelief and greed. Lots of secrets are yet reveiled but hold back for misuse of power. 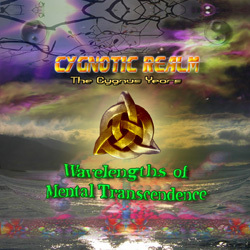 'Tranceformation' represents the portal to mental transcendence. Continuative to 'Gliding Through Liquid Light' I used again the ethereal singing of the whales that melt together with the layered overtone-structures and resonance-screams of the mighty Nordlead-Synthesizer. The drum rhythm that builds up step by step chases the soundstructure to driving basslines and furious acid attacks. The inner doubts and conflicts. Pursued we fall into the darkness of infinity, accompanied by frantic and sinister sequencerpatterns. An eternal fall, that is absorbed by the saving melodic structure, just to be chased on by evil forces. There the mental metamorphosis culminates in the fateful melodic pad of the brainwaves and merges with the pushing acidlines of the Nordlead and the Kawai 5000 to symbiotic resonance. A purifying break of guitartriols and we float on to transit even more nocturnal regions of the mind. One of the most intense passages of WOMT when the Nordlead lazes a trail through the twisted screams of tortured souls exploding into the observing additive arabic overtonestructure of the Kawai 5000. The bright & melancholic cygnotic side. Actually 'Chilling Fields' could be considered as a stand-alone album, but on the other hand the inverse of the 'Pulsating Spheres' that rounds up the whole concept of the dualistic sides that are needed for balance. Now we can fall deep into relaxation. Wavelengths, that only vibrate in resonance when you take yourself this time for chilling. The 'Chilling Fields' are a melted union of 4 tracks, beginning and ending with sampled Goa-Waves. Wavelengths of meditation. This chilled meditation track ist very much affected by my Goa-Trip in 1998. While composing and of course while hearing I feel like transported back to my meditation rock in Goa, with the endless view to the sparkling sea. Everything is possible, nothing is impossible! These impressions I experienced there I tried to capture on 'Wavedrifter'. 'Driftin' in the waves' that we call life. In eternal remembrance. The Didgeridoo was played by australian pal Rene. Thanx man! ...reflects some transfigured moments of my California-Trip 1996. This moment I stood on Stratosphere Tower in over-appealed Las Vegas, looking down from above to the distant sea of lights...nothing more to feel from the hectic of the Strip than a misty dream. Very emotional, as every track, the track came up from this mood I conserved...standing on Stratosphere, humble, in awe, without fear...Stratosfearless. Again the Nordlead-Synth shows blissfully his filter qualities. Again an emotional entry in my soul diary. As you have to ride the waves of life, when the sinus reaches its peak you also have to master the valley of the wave. A special track originated from an ending relationship I sat down in my beloved melancholic mood at my legendary Waldorf Microwave Synth und played the sad basic theme. With the next layered Microwave-sequence sadness slowly but unstoppable was transformed to purest hope and awareness of 'knowing'. With the lead-voice of the beautiful lamenting Moog-Interpretation of my beloved Kawai 5000 resonance was completed and sadness gave effortless way for an euphoric and hopeful released mood. A healing track for riding the waves. As hope and trust remain eternal your mind will always approach to a new enlightened zenith from the valley of emotional sea...again and again. Deliverance to come! ...dedicated to my female companion through the waves. A worthy closure is reached. 'Dreamloop' is the last-created track on WOMT and results from a dreamlike transfigured afternoon on a golden october day sitting on a hidden bench in my hometown at the river Main where I still felt the warming rays of a magical falling sun, reflecting mindwaves on the water...a time of conscious awareness...accomplishment. With this magic inside I went to my studio. The kawai provides the dreamy and snuggling basic melody. The inspiring confidence I reflected on my inner eye I transmitted through the electronic circuits. I completely immersed into this endless loop, being keen enough to dust off my guitar. A timeless dream of eternity. We meditated on 'Wavedrifter', let go on 'Stratosfearless', were filled with euphoric melancholy in Neverending Hope and dreamed on 'dreamloop'. Everything is possible, nothing is impossible. Have trust my friends.